LEXAN™ sheet portfolio from SABIC offers transparent and opaque sheets that combine formability with excellent flame-retardant properties. Transparent products meet the flammability requirements of the European building and construction market. 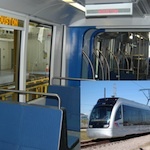 Opaque sheets can be used for interior applications in a wide variety of vehicles, ranging from train seating, to aircraft wall panels and specialty vehicle cladding.